The rainforests in the southwestern part of the Amazon Basin in southeastern Peru are home to scores of amphibians and reptiles. 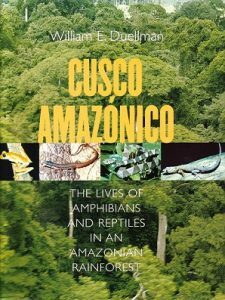 Cusco Amazónico is a richly illustrated and comprehensive account of the lives of 151 of these species. William E. Duellman’s masterpiece of community ecology includes descriptions of the physical environment and vegetation found in this unique habitat along with syntheses of abundance, mass, feeding, reproductive guilds, and daily and seasonal patterns of activity. Identification keys in English and Spanish precede detailed and illustrated species accounts. Tadpoles of many frogs are described and illustrated. Artist/Author: Donnelly, Maureen A. et al., editors. In these essays that survey the burgeoning field of tropical herpetology, former students and associates pay tribute to Jay Savage’s four decades of mentoring. The result is a book unlike any other available in tropical herpetology. 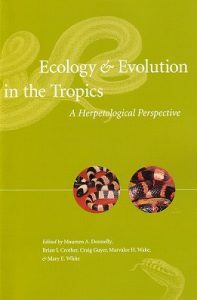 Covering a wide array of subjects, Ecology and Evolution in the Tropics is the first book in more than two decades to broadly review research on tropical amphibians and reptiles. A tribute to Savage and an invaluable addition to the herpetological literature, this work will be cited for years to come. Also available in hardcover, POA. 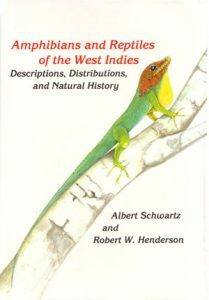 Amphibians and reptiles of the West Indies: descriptions, distributions and natural history. Artist/Author: Schwartz, A. and R. W. Henderson.